Give your regular mashed potato recipe an Indian twist with this spicy mashed potato recipe. 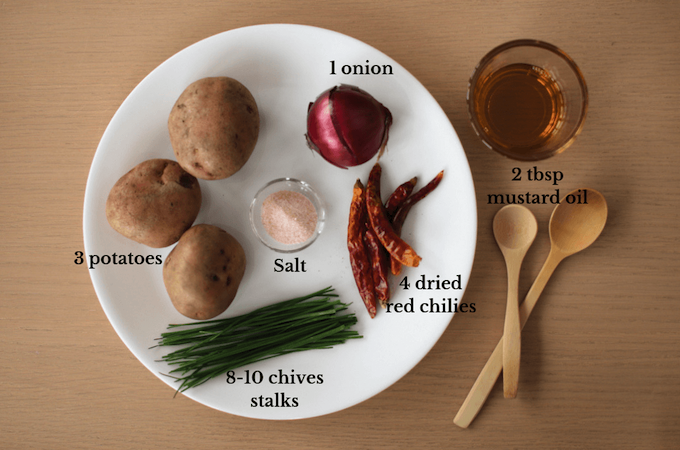 Boiled potatoes are mashed together with a spicy mustard oil tempering in this traditional recipe. I am so glad I discovered this Manipuri Aloo Kangmet recipe through a bloggers’ challenge. I love potatoes and I love to explore new recipes celebrating this humble vegetable. Till I made this one, my go-to recipe for a dry potato side was this easy potato fry recipe. And now it’s both of these recipes :-). The recipe is super simple with just 6 ingredients. I loved the smoky mustard oil taste and also that of fresh chives. In Manipuri cuisine, they use a lot of red chilies. I used only half of what I was told by a friend whom I called for the recipe and it was right at the top edge of my heat tolerance. So adjust the chilies according to your taste. This month our Indian food bloggers group, “Shhh… Cooking Secretly”, chose the Northeast State of Manipur to explore and blog about. Manipuri cuisine is pre-dominantly non-vegetarian with a lot of fish preparations so I was a bit concerned if I will be able to find a vegan or vegetarian dish. But I needn’t have worried at all. In India, we love our potatoes and every cuisine and every region is sure to have a traditional potato recipe. The purpose of the group is to have some fun while exploring new cuisines and blogging. 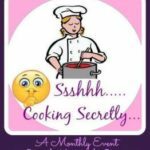 Every month, two partners are paired and based on the monthly theme they give each other two secret ingredients to cook with. This month, I’m paired with Veena who blogs at Veena’s Veg Nation. Manipuri cuisine has so many fresh green vegetables, root vegetables and aromatic herbs that vegetarians can easily thrive. 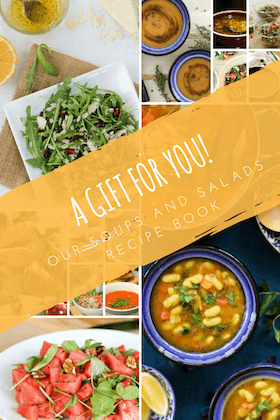 The ingredients are very similar to those found in SouthEast, East, and Central Asian cuisine like Chinese chives (naakuppi), Vietnamese Coriander (phakpai), Lemon Basil (Mayang-ton) and water spinach (morning glory or kolamni). Common vegetarian dishes include Chamthong or Kangshoi which is a stew of seasonal vegetables; kaang-hu which is a vegetable stir-fry; chutneys; sana thongba is a Manipuri paneer or cottage cheese dish, a-nganba which is steamed root vegetables and beans and aloo kangmet which is this recipe of spicy mashed potato. The traditional dessert is a rice pudding made with black sticky rice. After reading so much about Manipuri Cuisine, I can’t wait to travel to this beautiful State! The cooking oil is mostly mustard oil and they use a lot of red chilies in most recipes. And these were the two secret ingredients that Veena gave me to cook with. When I saw the aloo kangmet recipe, I felt it would a nice Indian twist to the regular mashed potato recipe. It sure was delightful. I paired it with plain paratha (Indian flatbread) and green moong dal curry. A complete meal. I hope you like the recipe! 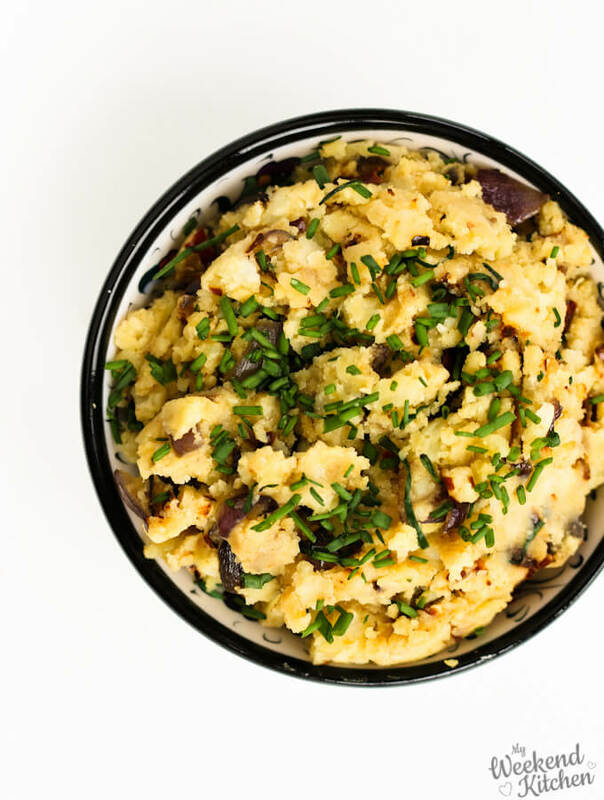 Give your regular mashed potato recipe an Indian twist with this spicy mashed potato recipe. Boiled potatoes are mashed together with a spicy mustard oil tempering in this traditional recipe from Manipuri Cuisine. In a deep pan, bring 1-liter water to boil. Wash, peel, and chop the potatoes into small chunks. Add the potatoes along with some salt to the boiling water. Cover and let cook. Meanwhile, chop the onions and chives. Heat mustard oil in another pan. When the oil is hot, add the dried red chilies. Sauté for 30 seconds. Remove on a kitchen towel. In the same oil, now add the chopped onions. Sauté for a minute till they start to soften. Add salt and chives. Mix and sauté for another minute remove from heat. Coarsely crush the roasted red chilies in a mortar-pestle and add to the mashed potatoes. Add the onions and chives mix also to the mashed potatoes. Mash with the potato masher or with a spoon to mix everything properly. Empty into serving bowl and garnish with some finely chopped fresh chives. 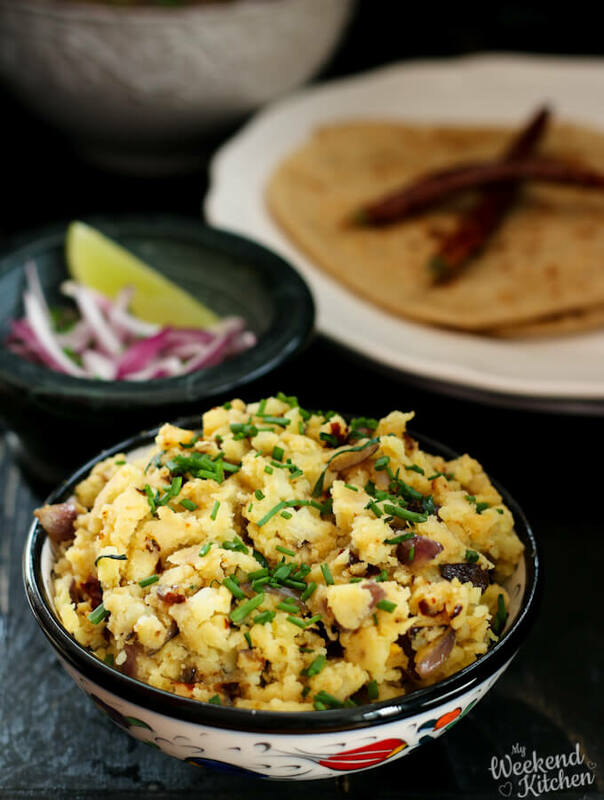 Serve hot as a side with flatbread or rice and dal. To make this recipe creamier, you can add some of the stock from draining the potatoes to the boiled potatoes while mashing. Nutritional Information is approximate information for 1 serving. If you like this recipe, please review and/or leave your thoughts in the comments below. It will really make my day and encourage me to keep exploring! This is a delicious dish of mashed potatoes. Sometimes I add amchur to my potatoes, to make the dish a little tart. Yes, amchoor will be a great addition to the dish too. Even I tried the same recipe but without onion.. Your version sounds yummy. will try soon with the addition of onion. It sure is a simple and flavourful dish. Just a few ingredients and a perfect side for any meal! Beautiful simple and delicious potato dish. Loved it. Something like aloo bharta but different. It will also go well with dal chawal. I will try it for sure. yes, it is a lot like aloo bharta (mashed potato). I also love how simple and delicious the recipe is! Any potato dish has me drooling and this Alu Kangmet is so calling to me. The chives must add a great flavour to this dish. Superb pics. The chives add a beautiful freshness to the simple recipe. The Aloo Kangmet sounds delicious. There are so many versions of mashed potatoes just in India, and each one varies in one way or the other from the rest! The tempering with dry red chillies seems to set the aloo kangmet apart from the Assamese Aloo Pitika! I must try this version soon! I am glad that you liked the picture so much! It is such a simple and humble dish. Mashed potato looks absolutely delicious and inviting . And loved the addition of chives on the top. Ashima, I loved the use of chives in your recipe and it does add the Manipuri touch to it. Mustard oil and potato is a heavenly combination. Easy veg option for sure. Looks delicious. Lovely video Ashima, no fuss and not too long. 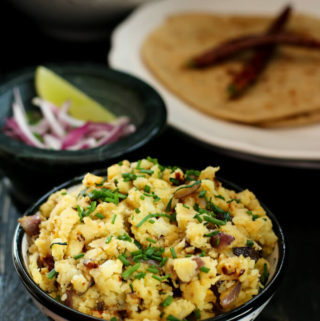 As for the aloo kangmet, what an easy and yet flavorful side dish. I think I would just enjoy it on its own. A very simple and quick dish. Using mustard oil and red chillies must have added a distinct flavour and makes it different from the other potato recipes. Mustard oil is slowly becoming my choice of oil for cooking most Indian recipes. I love its nutty flavor and deep aroma. I was so happy to see that Manipuri cuisine largely uses mustard oil for cooking! Roasting red chilies in mustard oil and crushing it would have released so much flavour and aroma. Such a simple recipe which we can rely on when we are short of time. Bookmarking it. Also the video is real good.. Yes, roasting and crushing really enhance the chili flavors.It also makes the dish spicier 🙂 I am so glad you liked the recipe and the video! the crushed, fried red chilies . Can imagine how much flavor it must have added to the dish. Crushing the chilies releases their flavor and adds the spicy kick to the dish instead of having them whole! Its one of my much loveable dish using potato 🙂 The dish is super simple still taste amazing ! Isn’t it such a simple and delicious side!